Today would have been my mother’s 90th birthday. Although it’s a year and a half since she died, it’s still hard for me to believe that she’s no longer with us. My grandmother lived to 103, and my mom’s three siblings are all alive and healthy ( a few months ago her older sister moved out of her home into an independant-living apartment–at aged 94!) We fully expected my mom to be around at least until 100. 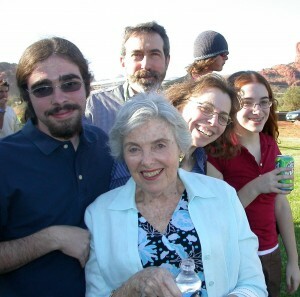 My mom joined us for Jake’s high school graduation, May, 2006. She spent a week with us every summer, usually over her birthday. And two years ago, on her last visit, she was a trooper like always. We spent the day in Chicago. It was almost as hot as today but we still spent hours at the Art Institute, drove around to see the sites, and went to dinner with my son Jake. She got such a kick out of seeing the city and how it had changed since she her only other visit (when my dad had a meeting there, maybe 50 years ago?) I also went walking with her in my neighborhood most days–she huffed and puffed a bit going up our hill, but insisted that she could do the one mile loop. It was clear that she had slowed down, but she still made 88 seem like a breeze. So when she visited my sister the next month and my sister was certain something was wrong, I had my doubts. But a month later she had a cancer diagnosis, and two and a half months later she passed away. Watching someone you love decline is never easy. It has bothered me that her final few months have played such a large role in my thoughts of her. But today as I think about my mother, I realize that that has changed. I see her once again as the vibrant, eternal optimist–the person who rewrote our family history with an oh-so-much more positive spin than my recollections. My mother would overhear a bit of conversation in a restaurant, and then concoct a complete story to fill in the details. She should have been a writer! Instead she tried to be my publicist–when she found out that the person sitting next to her on a plane was an elementary school teacher, she launched into a sales pitch for my books. Her pride in her children and grandchildren was evident to the end. I wish she was with us today. This entry was posted in Uncategorized on July 18, 2013 by Buffy Silverman.